One of our favorite tricks is to cut down our meat portion and bulk it up with lots of veggies! We sautéed up 99% lean ground turkey with black beans, jalapeno and fresh corn! We flavored it up with cumin, chili powder, lime & lots of fresh cilantro! 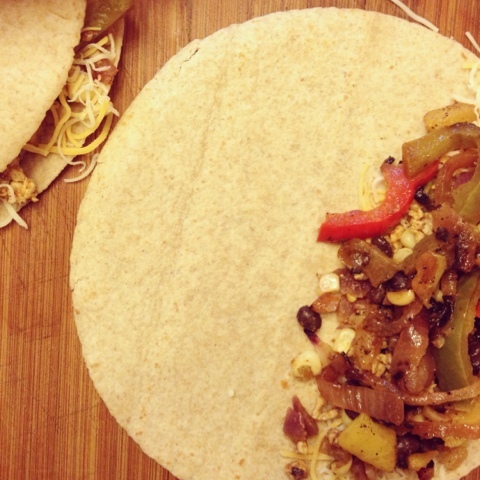 To balance the spice from the jalapeno we added in red peppers, onions and sweet and juicy pineapple! Our veggie packed quesadilla comes in at right around 300 calories and this includes the guacamole topping :) You can't beat that! 3. In same skillet add one tbsp. olive oil over medium heat. Add sliced onion, and peppers. Cook for 5-7 minutes or until onions start to brown and caramelize. Once brown add pineapple and sauté for an additional 2 minutes to warm. Set veggies aside for assembly. 4. To assemble - lay out tortilla on flat surface. Add one tbsp. reduced fat Mexi cheese to right side of tortilla. Add layer of meat, layer of pepper & pineapple combo and then one final tbsp. of Mexi cheese. Fold over tortilla. 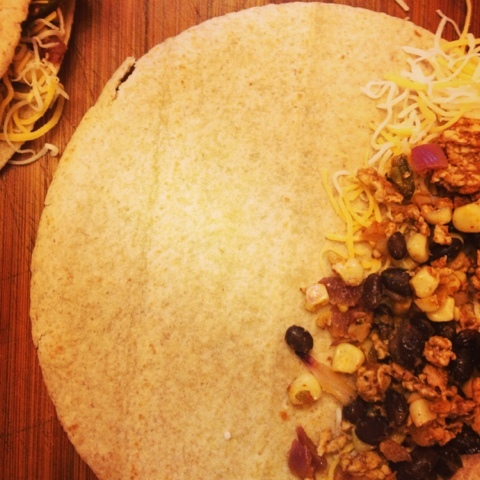 Continue to assemble all quesadillas. 5. Add non-stick spray to same skillet you have been using. Add two folded quesadillas to pan. Cook each tortilla for 2 minutes per side. Continue cooking 2 at a time. 6. While quesadillas are cooking, mix together guacamole topping. 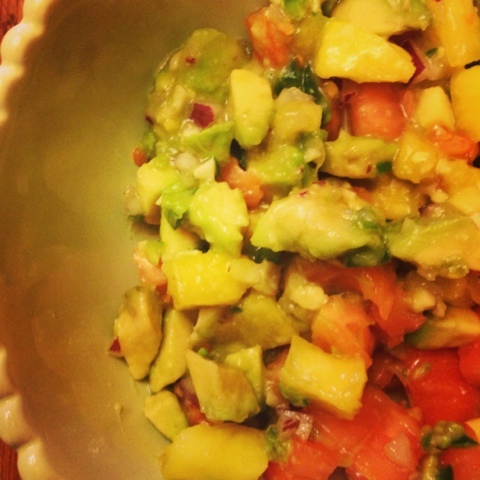 Start with one chopped avocado and season with a pinch of salt and juice from one lime. Mix in onion, tomato, pineapple, jalapeno, garlic and cilantro. 7. 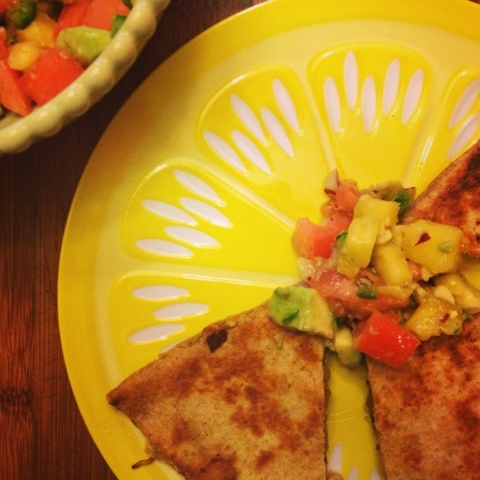 Slice each quesadilla into 3 slices and top with 1/8 of guacamole topping! Yuuum! These look really good :P I might try making these this weekend. I'm sure my fiancé won't even know it's healthy he he. Haha oh he won't ;) hope you both enjoy! Love quesadillas but pineapple? Never thought of that - consider it stolen! haha! Must try. 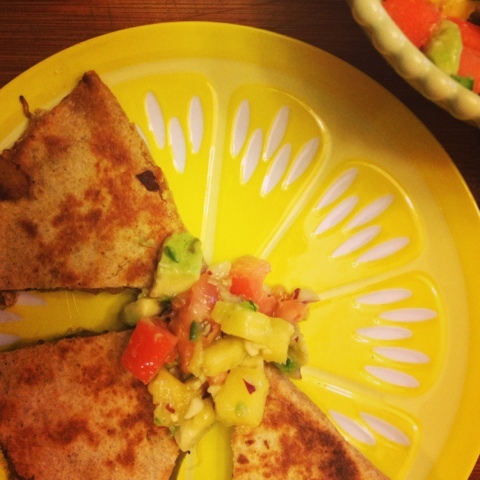 Yum these quesadillas look delicious! I've never thought of incorporating pineapple into mexican food, great idea!